Here’s a fact that we often ignore: unplanned pregnancy and abortion are a normal part of women’s reproductive lives. Roughly one-third of US women will have an abortion by age forty-five, and fifty to sixty percent of the women who have abortions were using birth control during the month they got pregnant. Yet women who have abortions are routinely shamed and judged, and safe and affordable access to abortion is under relentless assault, with the most devastating impact on poor women and women of color. Rebecca Todd Peters, a Presbyterian minister and social ethicist, argues that this shaming and judging reflects deep, often unspoken patriarchal and racist assumptions about women and women’s sexual activity. These assumptions are at the heart of what she calls the justification framework, which governs our public debate about abortion, and disrupts our ability to have authentic public discussions about the health and well-being of women and their families. Abortion, then, isn’t the social problem we should be focusing on. The problem is our inability to trust women to act as rational, capable, responsible moral agents who must weigh the concrete moral question of what to do when they are pregnant or when there are problems during a pregnancy. Ambitious in method and scope, Trust Women skillfully interweaves political analysis, sociology, ancient and modern philosophy, Christian tradition, and medical history, and grounds its analysis in the material reality of women’s lives and their decisions about sexuality, abortion, and child-bearing. It ends with a powerful re-imagining of the moral contours of pre-natal life and suggests we recognize pregnancy as a time when a woman must assent, again and again, to an ethical relationship with the prenate. Rebecca Todd Peters is Professor of Religious Studies at Elon University. 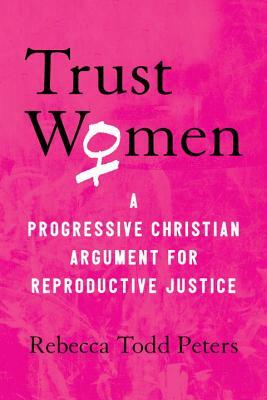 Her work as a feminist social ethicist is focused on globalization, economic, environmental, and reproductive justice. Her books include In Search of the Good Life and Solidarity Ethics. Ordained in the Presbyterian Church (USA), she has been active denominationally and ecumenically for more than twenty-five years and currently represents the PC (USA) as a member of the Faith and Order Standing Commission of the World Council of Churches.